Fellow bakers, get your spatulas at the ready! Tomorrow, I am going to visit relatives for lunch, which gave me a great excuse to try out this fab Delia Smith recipe I’d been saving to bring as a gift! No one could possibly resist this heavenly combination of aromatic coffee blended with ground cardamon seeds, and roasted pistachios thrown in for an extra kick. I baked it twice (no complaints from family there!) and made a few tweaks, and here are the scrummy results! While this cake was baking, I also began mulling over the rest of my Easter holidays. It’s such a gorgeous time of year and I can’t wait to immerse myself fully in the wonderful blossoming of spring! Hooray for longer evenings and sunny beach walks! And with spring comes the beginning of outdoor eating and that can only be a good thing. 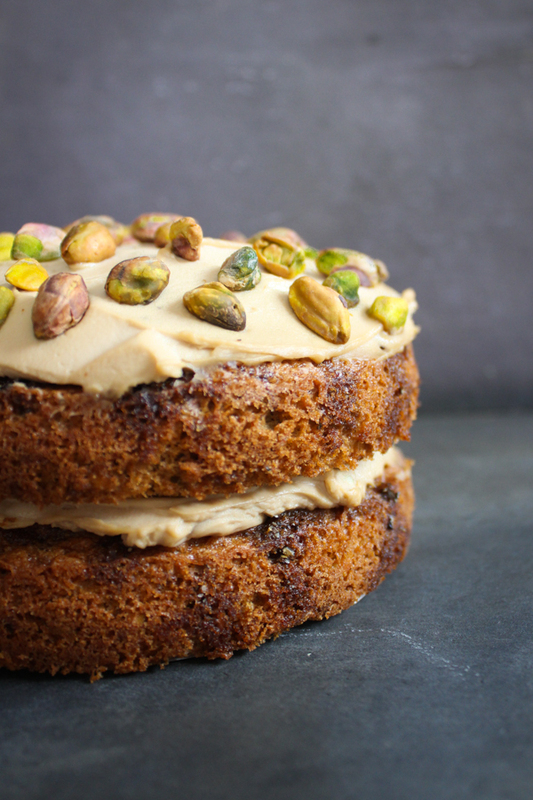 Talking of eating…I am getting a craving for a slice of this heavenly cake with a strong espresso on the side…temptation wins! Lightly butter and line the base of two 15cm by 4cm sponge tins. Preheat the oven to 170 deg C.
Spread all the pistachios on a tray and roast in oven for 8 minutes. Meanwhile, place 10 of the cardamon pods in a pestle and mortar and bash them to split them open. Remove seeds to a saucer. Repeat with the other 10 pods and put the seeds in a separate saucer. Now, grind the seeds, keeping them separate, to a fine powder. When the pistachios are ready, chop half of them finely and keep the rest to one side for the topping. For the cake, sift the flour and baking powder into a large bowl. Add the butter, eggs, caster sugar, instant espresso and one saucer of cardamon powder. Using an electric whisk, mix until smooth and creamy. Next, fold in the chopped pistachios. Divide the mixture evenly between the two cake tins. Bake for about 25 minutes. 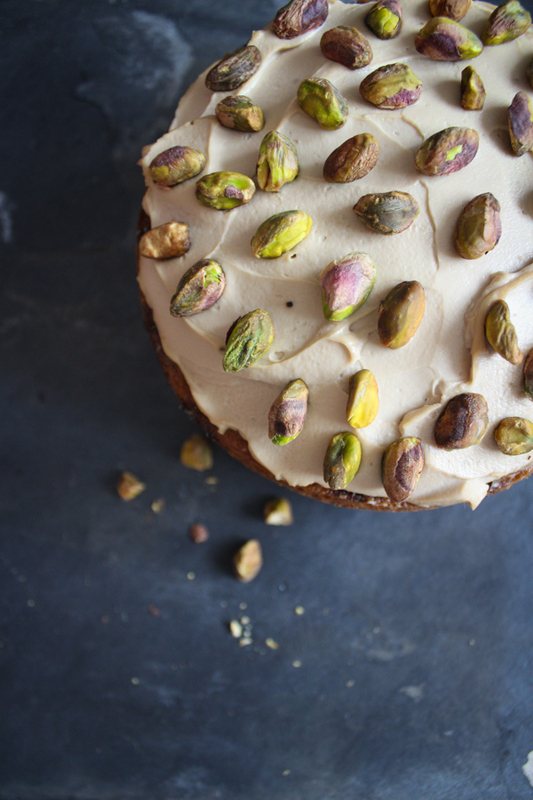 For the filling and topping, whisk all the ingredients, except for the pistachios, together in another bowl. Remove the cakes from the oven. While they are still hot, prick them all over with a skewer and sprinkle the syrup evenly over each one. Leave to cool in their tins. When the cakes are cold, remove from tins. Spread half the filling mixture on top of one cake and place the second cake on top. Spread the top of the cake with the other half of the mixture. 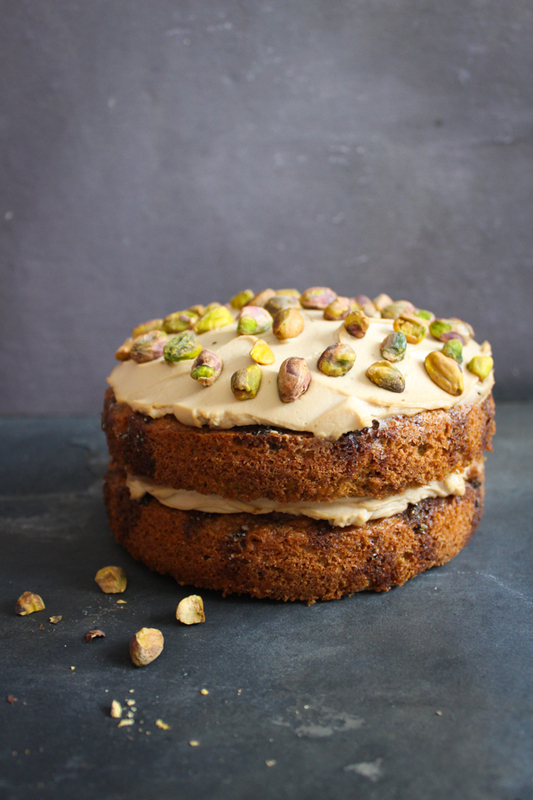 Scatter the roast pistachios all over the top of the cake. If you don't have instant espresso coffee powder, just use your pestle and mortar to grind up some everyday instant coffee granules!